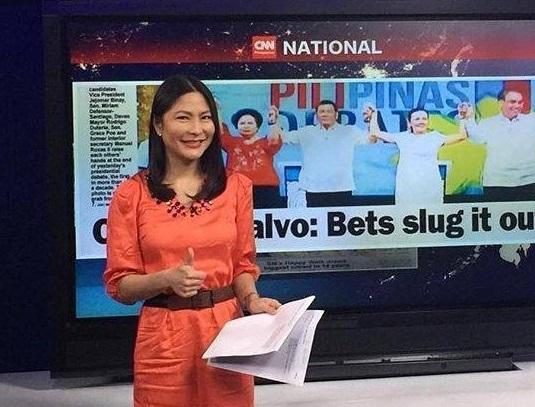 Karen Jimeno has officially left CNN Philippines after being appointed as the new undersecretary for legal affairs and priority projects of the Department of Public Works and Highways. Jimeno, who has been the co-anchor of the morning news program New Day since February, took her oath Tuesday before President Rodrigo Duterte, along with more than a hundred other government appointees. Jimeno began her television career in 2012, joining then Solar News Channel as co-host of Legal HD. She would remain in that post — even after the departure of Rod Nepomuceno — until February of this year. Aside from serving as co-anchor of the localized edition of New Day, Jimeno also participated in some of CNN Philippines' special events coverages, including the PiliPinas VP debate in April, and the first State of the Nation Address of President Duterte in July. Since November 2015 to June of this year, Jimeno also served as the head of Smartmatic's Voter Education Committee.